I recently overheard a girl say that she felt naked without makeup. That she never sets foot outside of her house if her makeup isn't done. Later, I saw her (after she had been 'dared' to not wear makeup for the day), and was surprised at how different she looked. It was only because I had gotten so used to seeing her with a full face hidden behind makeup and had never seen her for who she really is. She has beautiful features, but is so different behind all that stuff and fuss so it was a bit shocking to see her face so pure and clean. I don't have anything against makeup. I use it myself. But we must be careful with how MUCH and how OFTEN we do wear it. Do you want people to get used to always seeing you with it on so that one day, when you don't wear it, they feel like they're looking at a ghost? Makeup shouldn't be used to hide behind, or to try to make yourself more beautiful. It should be used to enhance the beauty that is already there. The above girl's story inspired me to write the following poem. And to take the pictures below. 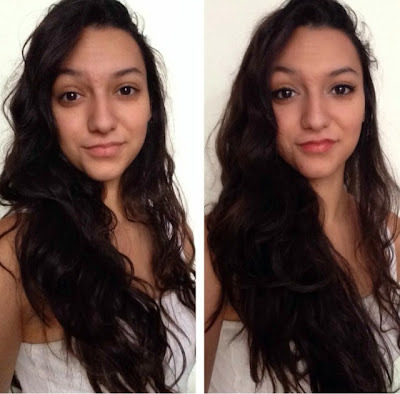 It's a side-by-side (unedited) comparison to how much makeup can change a person's looks. If you would like to join in on the #InHisOwnImage campaign, copy and paste this poem (by me) into a post of your own and take two pictures of yourself. One without makeup, and one with. Include them in your post, then comment with a link to it. We are beautiful, not because the world says so. Not because of the makeup we use. Not because of our body shape. We are beautiful because God created us in HIS OWN IMAGE. And in His eyes, we are spotless and without blemish. I will be posting this on Facebook and Instagram (@itsjustraquel), so feel free to join on there too. But are they truly what you want? Or be confident in who you are? Or the imperfections on your face. Is if you love Him with all of that. SO TRUE! Thank you for posting this! I hope to join this when I get a couple pictures taken!